Lt. Richard Haun spends much of his time documenting cases on the computer. Simply put, Richard Haun is living his dream. As a teenager, Haun knew exactly what he wanted to do. With timely guidance and self-determination, he has more than achieved his goal. Not bad for someone yet to turn 40 years old. Haun is actually Lieutenant Richard Haun of the Holmes County Sheriff’s Office. He has been with the sheriff’s office for 24 years. Do the math and the answer becomes apparent. Haun began his law enforcement career at that tender age of 15. It really all began with some public service modeling by his mother and encouragement from a friend that got Haun thinking about life in law enforcement. His mother served as an emergency medical technician, and a friend encouraged him to join the Boy Scouts of America troop that served as Explorers with the sheriff’s department. One assignment of the Explorers was to be a presence at the Holmes County Fair. He began making his rounds there in 1986 and hasn’t missed a fair since then. Born in Millersburg, Haun grew up in Killbuck and graduated West Holmes High School in 1989. With his sights set on a career in law enforcement, Haun didn’t have much social life as a teen. “I would go to school during the day,” Haun said, “then attend the police academy in Coshocton in the evening.” Haun said those classes ran from 5 p.m. to 10 p.m. Monday through Friday. Haun lives in Millersburg with his wife, Susan, and two sons. The Hauns have been married for 17 years. Haun started as a reserve officer in 1988. He went full-time in 1989 as a dispatcher in the communications division and has worked his way up the law enforcement ladder one rung at a time. Haun has been a road patrol deputy, the supervisor of road patrol, a court bailiff and a detective. Now he is supervisor of both the civil division and the child support division. Haun spends much of his day doing electronic paper work on the computer. He has to stay up on changing laws and attorney general rulings and relay that information to the rest of the sheriff’s office staff. 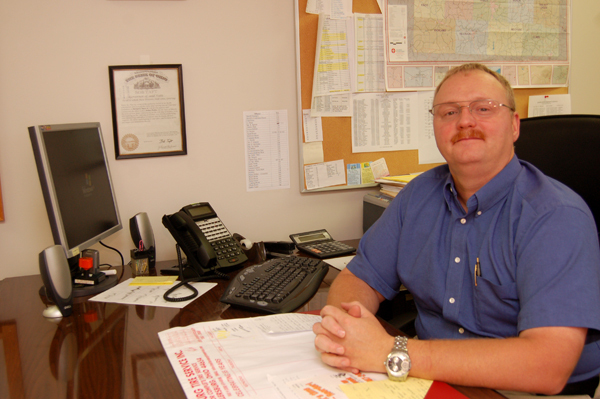 During his years with the sheriff’s office, Haun has seen first-hand how crime has changed. He said the sheriff’s office deals more and more with identity theft and computer theft. Haun coordinates prisoner transports, court appearances, and monitors all of Children’s Services needs when it comes to background checks for employment and those seeking employment. The various positions he has held have required him to train in all divisions. Haun said his experience and training, including online training, enables him to be flexible in his work. “I do regret not going to college,” he shared. “But if I were to count all the hours of training I’ve done, I probably would have some kind of degree.” He said he would encourage his sons to go to college. Still, Haun has no regrets about the career path he has chosen. “It’s a pleasure to be of service to the public,” Haun said. This story first appeared the Holmes Bargain Hunter.